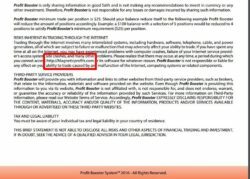 In this article we are going to review a new binary options scam called “Profit Booster”, it is presented by William Blake. Blake claims to be a financial analyst who developed a trading algorithm and incorporated it into the Profit Booster trading system. 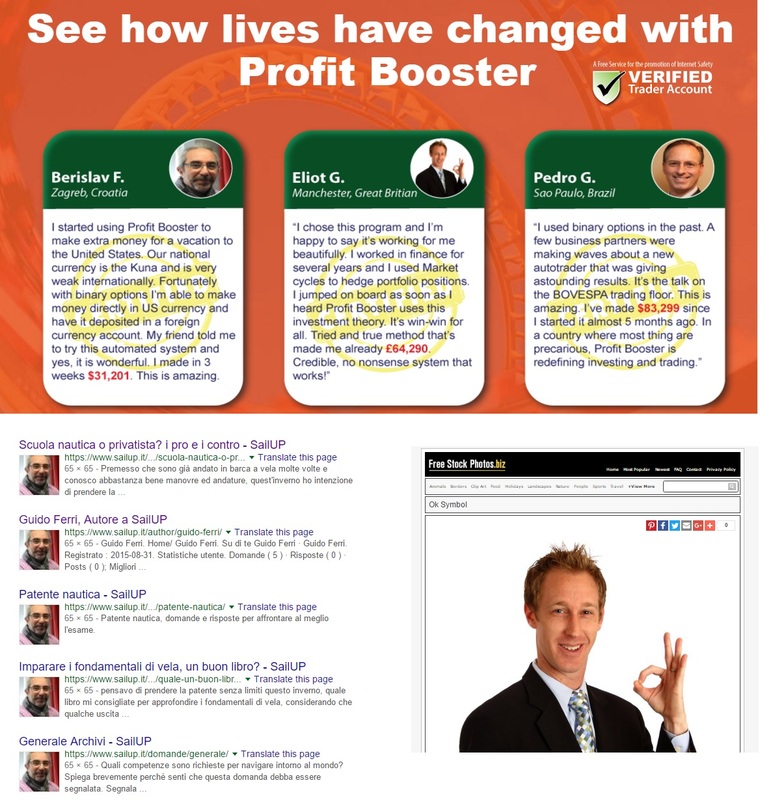 Profit Booster is designed for trading binary options and it allegedly has an 85% winning ration. If you use the broker assigned by Profit Booster, you can the trading system for free. The Profit Booster presentation is full of lies, so it is a scam. We believe the only purpose of this scam is for them to get affiliate commissions for bringing new depositors to their broker. The trading systems itself is extremely probably worthless. Let’s start with the company. On their web site you see photos of their staff, but these pictures have been taken from various sources and belong to somebody else. So these identities are fake, the company very probably does not even exist. There is also a screenshot of an article that has allegedly been published by CNN Money. But it is a fake too, CNN has never published anything about Profit Booster. 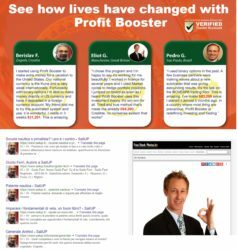 Testimonials of people who allegedly made money with Profit Booster are fake too. Photos have again been taken from various sources all over the internet and belong to somebody else. 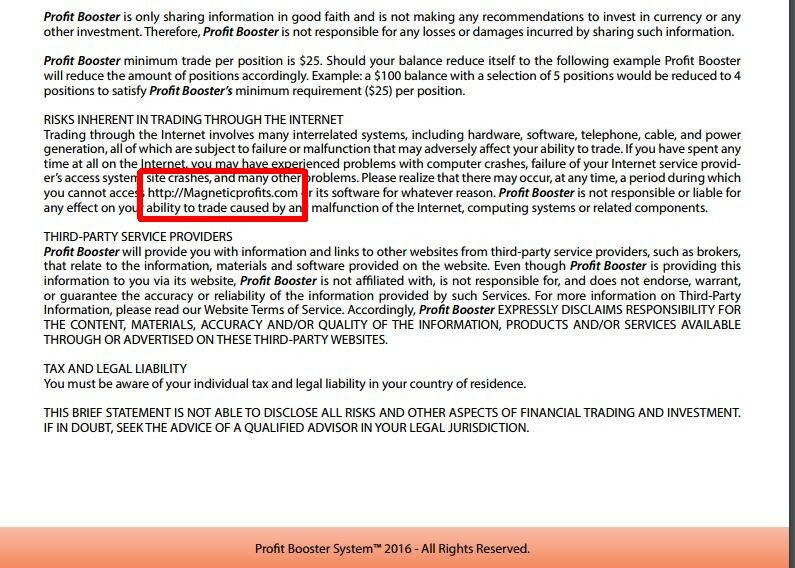 We had a look at the Profit Booster Disclaimer and we found an interested thing. They mention Magnetic Profits, which is another binary options scam. So they obviously took the original document from that scam and just edited it, but they forgot to replace everything. Profit Booster is just another scam that needs you to deposit with an unregulated maker to make money to its owners, so stay away. If you are interested in making money with binary options, try a free demo account. You’ll be trading with virtual money so that you can assess if binary options are for you.